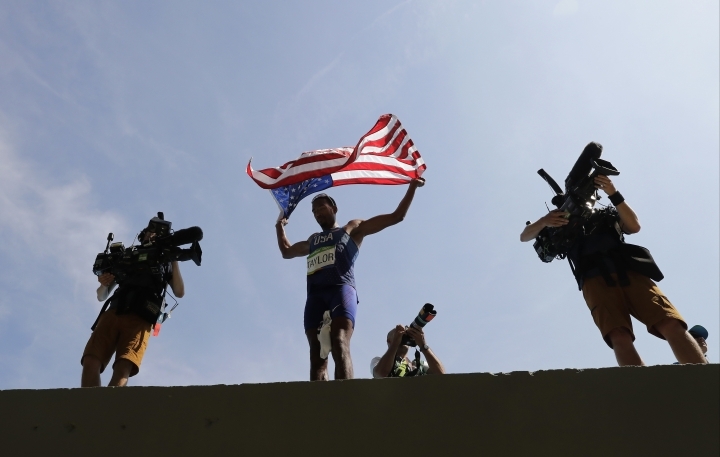 RIO DE JANEIRO — The repeat one-two American finish in the triple jump, the Jamaican gold medal in hurdles and Jenny Simpson's unprecedented bronze in the 1,500 meters were only part of the story in Olympic track and field Tuesday — and maybe not the best part. The midpoint of the nine-day program at Olympic Stadium was a day for diamond rings and making friends, a one-of-a-kind Russian hello and a surprising Brazilian farewell. And, of course, a daily dose of doping news that was more than offset by a speedy cameo from Usain Bolt. Bolt was on the track early for his 200-meter qualifying heat — a no-fuss 20.28-second ramble around the curve that barely raised his blood pressure. 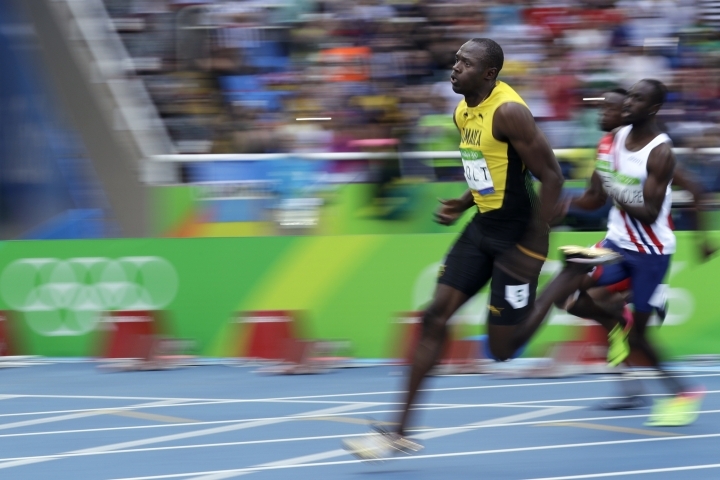 "I'm not an early-morning person," Bolt proclaimed, shortly after winning his heat, which actually started at the crack of 12:46 p.m. But morning seemed like the perfect time for American Will Claye to put an exclamation point on one of his greatest moments. 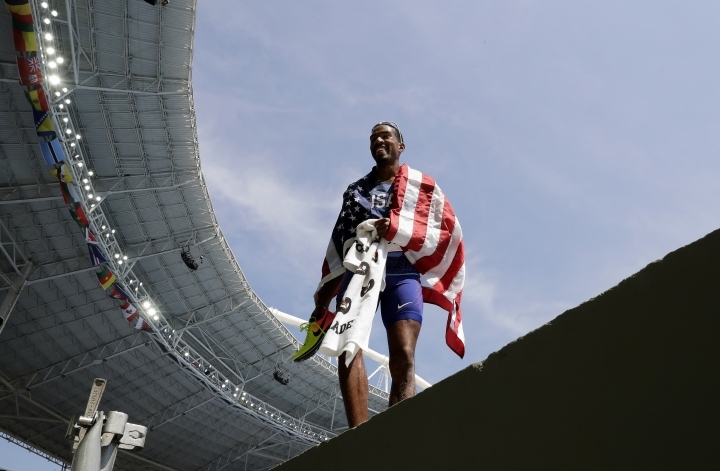 Newly minted with his second straight Olympic silver medal in the triple jump — countryman Christian Taylor won gold, also just as in 2012 — Clay clambered over the barrier separating the track from the stands, climbed a few rows to meet his girlfriend, bent down on one knee and popped the question. Queen Harrison, an Olympic hurdler in 2008, said yes. "When I woke up this morning, I was like, 'Today's going to be the best day of my life,'" Claye said. Omar McLeod certainly felt the same. 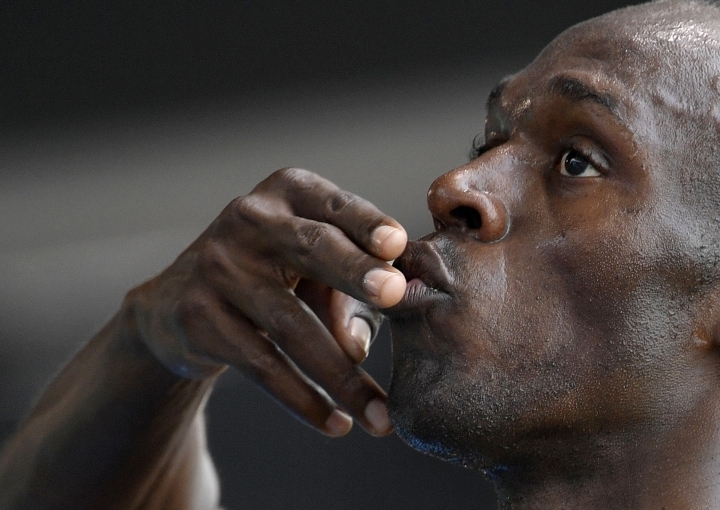 His win in 13.05 seconds over the 110-meter hurdles in the evening's final event made it three gold medals on the straightaway for Jamaica so far. He beat Orlando Ortega of Spain by .12 seconds. Dimitri Bascou of France took third, and University of Oregon football player Devon Allen finished fifth. "They harness medals," McLeod said of his country's sprint stars. "You want to do the same thing. It's contagious. You want to feel how it feels. I felt how it feels." In the evening's other big race, Faith Kipyegon of Kenya finished the women's 1,500 meters in 4 minutes, 8.92 seconds to beat out Genzebe Dibaba of Ethiopia, a flip-flop from last year's world championships. Simpson took bronze to become the first American woman to medal in the event. "Hopefully, every American watching my race tonight, I want them to think they can take a small piece of ownership in this medal," Simpson said. Other gold medalists were high jumper Derek Drouin of Canada and discus thrower Sandra Perkovic of Croatia, who twice was a single throw from elimination but came through both times and defended her Olympic title. 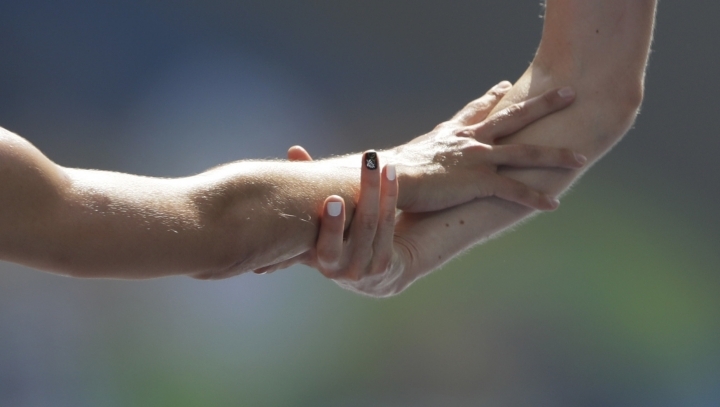 Yet, like many of the best moments on this emotion-packed day, there were no medals on the line when long jumper Darya Klishina finally showed up at the Olympics. During warmups, Klishina unzipped her jacket and revealed a red shirt with the word "Russia" emblazoned in bright white lettering. She's the only competitor wearing that uniform at this stadium, due to a doping scandal that led to the ban of Russia's other 67 track and field entrants. Never introduced by the PA announcer or acknowledged in any way — booing or cheering — by the crowd, Klishina jumped 6.64 meters to make it through qualifying and will have a chance for a medal Wednesday. "Last week, it was a really tough and really hard week for me mentally . I was waiting for the decision and I could not practice, I just did warmup," she said. "I would like to have a big Russian team around me, as usual, but unfortunately I'm here alone, and this is a great responsibility." But there was more bad news for the Russians. Around the time the evening session began, the International Olympic Committee stripped the country's 2008 women's 4x100 relay team of its gold medal, saying one of the sprinters tested positive in one of the many samples being reanalyzed this summer. Back on the field, the sparse morning crowd saw one shocker: Brazilian Fabiana Murer was expected to contend for a pole vault medal, which would have gone nicely with the surprise gold that Thiago Braz da Silva won in the men's competition the night before. But Murer, the silver medalist at the world championships last year, couldn't clear 4.55 meters in her first three attempts and was gone before noon. Da Silva's return to the stadium for the medals ceremony reignited an ugly episode from the previous night. 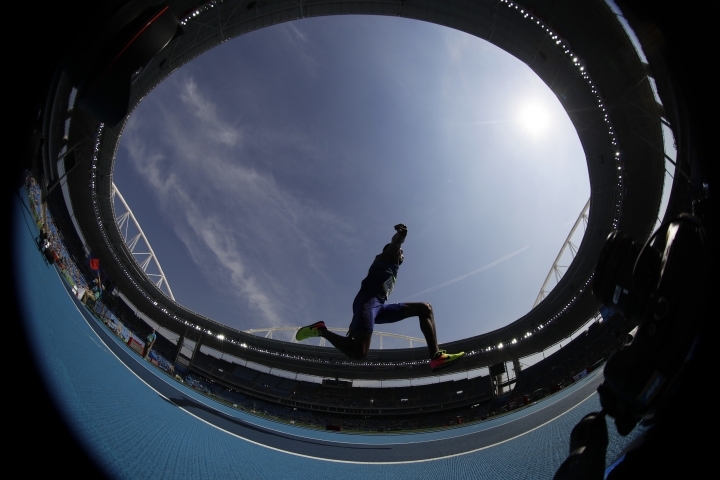 The French runner-up, Renaud Lavillenie, was roundly booed when his name was announced for the silver medal, much the way he heard jeers the night before as he prepared for the jump that decided the meet. The French press attache said Lavillenie was in tears afterward. 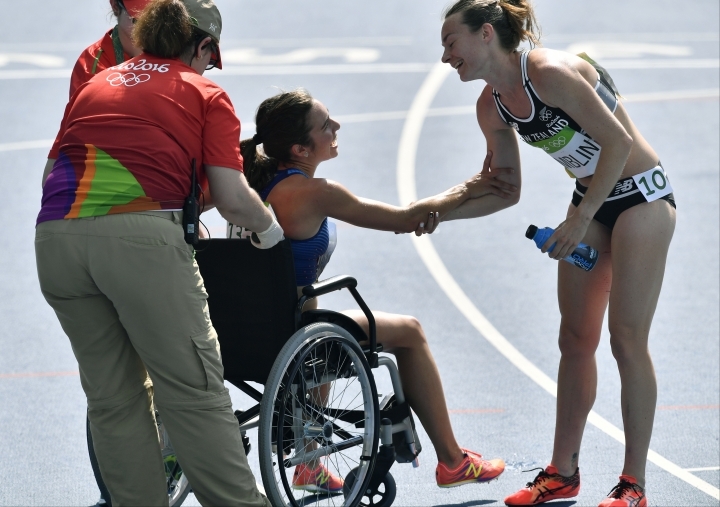 Midway through women's 5,000-meter qualifying, American Abbey D'Agostino and New Zealander Nikki Hamblin got tangled and fell hard onto the track. Hamblin stayed down, dazed. D'Agostino popped back up. But instead of forging ahead, she walked over to Hamblin, put a hand on her shoulder and said, "Get up. We have to finish this," then hoisted her to her feet to restart the run. Turned out, D'Agostino took the worst of it. She told Hamblin to run ahead, and when Hamblin reached the finish, she waited for her new friend. They exchanged a warm hug before the American got carted off in a wheelchair. "I'm never going to forget that moment," Hamblin said. "When someone asks me what happened in Rio in 20 years' time, that's my story." Hours later, race officials sent out a simple alert: The Track Referee, after examining the video of the race, was advancing both women into Friday's final. They offered no explanation. They really didn't have to.